GoBioMed's Air Cam Walker boot provides optimal support while incorporating many unique features that are specifically designed to provide superior patient fit and comfort. The rocker bottom walking base is specially designed to be low profile and wide to promote a natural and stable gait. The easy to use velcro straps are adjustable to fit the contours of the leg and to modify the level of pressure on the injury and account for swelling. 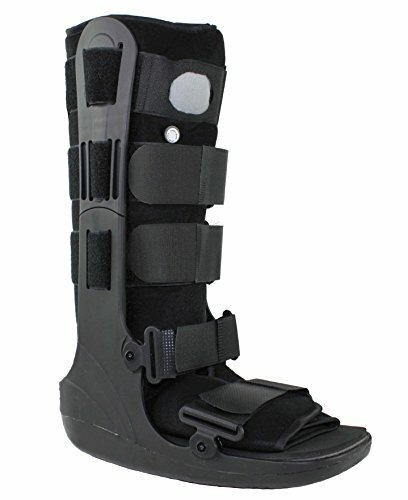 The unique shock absorbing sole of the of this medical cam walking boot minimizes the impact on the heel while walking, preventing further irritation of of foot or ankle injuries. Contoured strut design allows this orthopedic boot frame to conform to the patients' anatomy, ensuring a better fit. Also, the universal design of this cam walker fits both right and left feet and features a soft washable liner to ensure comfort and clean hygiene. Available in both Tall and Low options - See sizing image for fitting. Lightweight Construction and rocker bottom promotes a natural step when walking. If you have any questions about this product by GoBioMed, contact us by completing and submitting the form below. If you are looking for a specif part number, please include it with your message.